Blue Raster is proud to have contributed to the development of the UDS Mapper for HRSA, (Health Resources and Services Administration) part of the U.S. Department of Health and Human Services. This web mapping application is developed using Adobe Flex and ESRI ArcGIS Server and is deployed on the Amazon Cloud (EC2). Its assists with the decision-making process regarding grants for Section-330 federally-funded community health centers. 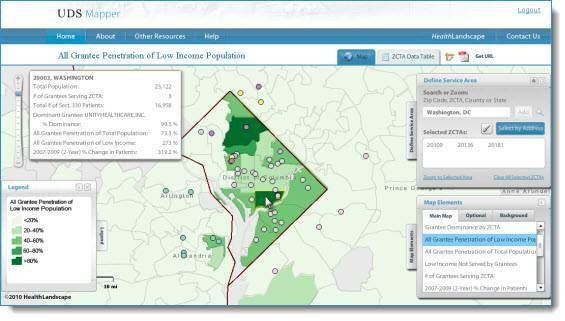 The UDS Mapper provides information previously unavailable to the public at the local level by allowing analysis of under-served populations across a dozen themes. HealthLandscape, Health Foundation of Greater Cincinnati and the American Academy of Family Physicians are among the partners in this multi-year project.